Do you like Legends of Honor? Share it with your friends. 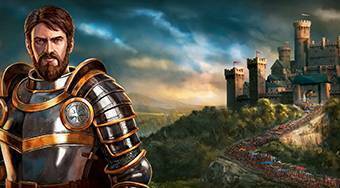 Legends of Honor is a medieval strategy MMO game developed by the reputable Goodgame Studios z Hamburgu. Will the German developers be able to match the fantastic success of the legendary Goodgame Empire or Big Farm, and will Legends of Honor become an internet hit? We will describe the basics of the game in the introduction of this article. We will also address strategies for defending the fort and preparing attacks, as well as the importance of diplomacy in the game. In conclusion, we will reveal some useful game tips and give our final rating of Legends of Honor. The main environment of Legends of Honor is a medieval fortified city that must be properly maintained. At the heart of the city is the main fortress, which you can gradually increase in size. During the game you will be able to move the city walls and thereby expand the area for the construction of a city infrastructure. Your people and soldiers live in the city. At the bottom of the screen is a control bar through which you can access the most important game modes (world map, construction, military, heroes, and others). In the bottom left corner you will find a list of tasks for which you get different rewards. In the top left corner quantities of raw materials and the people's level of satisfaction is specified. At the top center of the screen you can reveal the XP and honor, and in the top right corner you can change the game settings. The basic prerequisite to the successful development of the city is enough raw materials. Initially you will mostly need large quantities of wood and stones. For the construction of highly advanced buildings you will also need iron and sulfur in later stages of the game. You can get wood by constructing a woodcutters' hut, and stones by constructing a stone quarry. You can also get these materials manually by clicking the mouse on the forest or the mountains beyond the city walls. Because you obtain raw materials through the manpower of your population, you must make sure there is enough food in the city, which is produced by constructing farmhouses. In order for your people to have a place to stay, you have to construct houses through which you can levy taxes. The taxes are collected in the treasury, which you must also build. When the silver coin symbol appears above the treasury, you can collect the taxes by clicking on the coin symbol. This will increase the status of your finances, which appears in the upper left corner of the game window. Finances are particularly necessary to build a strong army. Gems are a bonus currency in Legends of Honor, which can be obtained either by completing various missions or by purchasing them in a shop. Finances and gems are shared by all cities, while other materials are distributed separately for each city. Another important aspect of a successful medieval town is the level of satisfaction of your people. The construction of houses and damage to the city after a battle decreases the people's level of satisfaction, while the construction of decorations increases the people's satisfaction. The people's satisfaction is influenced by the speed of the construction of buildings, the production of raw materials and the speed of the recruitment of troops, so you should always try to keep the people's satisfaction level as high as possible. The satisfaction percentage corresponds with the productivity. For example, with a 120% satisfaction rate you will achieve a production rate of 120%, etc. As noted above, no medieval town can do without a resourceful army. In Legends of Honor it is necessary to prepare a trio of basic military operations. These include recruiting troops, defending the castle and attacking enemy troops. However, before you start thinking of a military campaign, you will need a commander, or hero, if you will! You can display the hero overview by clicking on the hero information item on the bottom bar. Heroes are commanders of your armies and it is their task to defend the city or attack enemy armies. You create armies in the barracks. Once the armies are finished, they remain in the castle. To assign an army to a hero, go to hero information on the bottom bar and click on the unit window. Move the required number of units from the castle to the hero, and vice versa. In the workshop you can create boosters in the form of defensive or offensive weapons. It is preferable to keep defensive weapons in the castle for the protection of the city. You can equip your hero's unit with offensive weapons before offensive expeditions. You can almost unlimitedly enhance your armies in the armory building. Boosters (weapons) can be enhanced in the smithy. The military tab on the bottom bar will help you view military operations, so you don't have to visit each military building separately for every military action. Let's set out to fight! Click on the world map on the bottom bar. To move a hero click on the location on the map that you want to reach and confirm by clicking on move. To attack an enemy castle move to the vicinity of the castle and then attack. Before you start the attack the battle plan will appear, through which you will see the offensive force you have in the battle against the oppositions defensive force. It is not favourable to attack castles that are too weak, because you lose part of your honor through these cowardly attacks. Attack castles that are on a similar or higher level as your castle. Besides castles you can also attack other heroes that are wandering around the map. To obtain raw materials and increase respect you can attack marauders, which are computer players randomly deployed on the map. A very important value in the game is your total honor, which is obtained when you win battles against other heroes or their castles, but they cannot be too weak in comparison to you. You also won't gain any honor points by attacking an unoccupied castle. You can use the rankings tab in the lower right corner above chat to trace suitable candidates to attack. Look for heroes that are at a similar level as you and are not further than 120 boxes from you. Remember the player's name and search for him on the map through the magnifying glass icon on the bottom bar. Now you can launch an attack! Can you place in a top position in the overall rankings thanks to the battles you win? Diplomacy is an integral part of Legends of Honor. At the beginning of the game you choose between three possible fractions that you want to compete for. Within each fraction you can enter into alliances, where you will meet other players and coordinate both defensive and offensive strategies together. You can also create your own alliance or change the chosen alliance for another within the current fraction. Changing your fraction is also possible, but you will automatically be excluded from your alliance and you will lose all your honor points. Once you're in an alliance, it is preferable to move your city closer to other alliance members so that if your city is attacked you have an allied force to help you defend yourself. In advanced stages of the game, you will have acces to two other kingdoms that will fall into your empire. The game begins in The High Kingdom, then you gain access to the Ice Storm Mountains and finally The Dark Marshes. You can send raw materials and military units between the different realms. The Ice Storm Mountains will give you access to iron mining, which is necessary for constructing high-level buildings. The Dark Marshes give you sulfur, which is necessary for the most advanced enhancements. 1.) Perform game tasks from the overview in the left lower corner in order to receive bonuses and experiences that will enhance your level. 2.) Build a university and conduct research on wood and stone collection; this will allow you to gain two pieces of stones or wood instead of one when you click on the forest or mountains. 3.) Before a battle, examine the grounds to determine what type of army (cavalry, infantry or ranged) is at an advantage at the given site. According to the information you obtained, send your hero to battle with the preferential armed forces. 4.) Expand your walls as much as possible and build decorations in free places to make your people display high productivity. 5.) Once you unlock the new kingdom, don't hesitate to enhance your buildings to at least level 4. 6.) Build a hospital so you can treat wounded soldiers. Editor's rating: 90% - We give Legends of Honor a rating of 90%. It is a very successful and sophisticated MMO strategy. We highly appreciate the option to establish contact with other players within alliances and coordinate game activities with them. The game has very refined graphics that are excellent even on monitors with ultra HD resolution. Legends of Honor certainly has the potential to become a global hit because it is precisely localized into 29 languages. We subtract 10% for sporadic delays in loading rewards for completed tasks. The rewards only load after logging into the game again. Furthermore, the game could include the option of manual battles where you have the chance to defeat a stronger opponent.